The mainstay of Washington State's oyster industry is the Pacific Oyster, first introduced from Japan in 1902. 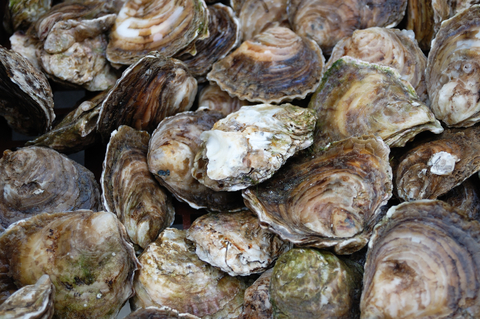 A native species known as the Olympia oyster formerly flourished on Willapa Bay, Oakland Bay, and southern Puget Sound, but today is harvested in commercial quantities only in bays of southern Puget Sound. Other transplants have also been tried, including Kumamoto oysters from Japan, and the European flat oyster from Holland. These are suitable as cocktail and specialty oysters, fitting into the size group between the tiny Olympia and the large Pacifics. Thus far only the Kumamoto has become commercially important, but production has been restricted for economic reasons. 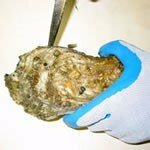 Pacific oysters grow to 12 inches and are found on firm or rocky beaches intertidally to 20 feet. Their shells are fluted, irregular, chalky-white or gray, new growth often colored purple, and can be distorted to conform to the shape of the object to which the oyster is attached. They are often found in groups attached to one another or to an object such as a rock or a shell. 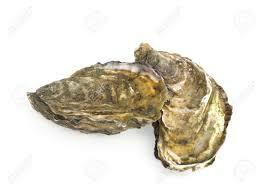 Oysters have uneven valves (shells). The lower shell is cupped and often attached to a hard object. The upper shell is flattened and smaller than the lower. Spawning during the hot summer months temporarily reduces the quality of oysters, making them less desirable. For more facts about oysters Click Here. Why is it Required to Shuck Oysters on the Beach? The shell provides the best setting and growing substrate for juvenile Pacific oysters. Removing the shells from a beach reduces the overall amount of setting surface, and therefore reduces the potential for new oysters to set. The shell also provides an excellent setting surface for the native Olympia oyster. Consequently, removing the shells reduces the potential for native Olympia oysters to set on the beach. This is especially true in places like southern Puget Sound, Padilla Bay and Samish Bay where the natural setting surface - Olympia oyster shells - was eliminated years ago by overharvest. Removing large, edible-sized shells from a beach invariably removes tiny Pacific and Olympia oysters which are attached to the larger shells. Thus, removing a legal limit of 18 oysters may actually remove three to five times that number of oysters - young oysters which would otherwise remain on the beach and grow to edible size.